After a long period of decline during the first half of the 19th century, Cartagena witnessed the beginning of a new dynamic in the latter half of the century as the result of a considerable increase in mining, which also acted as a stimulus for other industry and commerce. It was during this time that Cartagena would assume its current form, after the destruction caused by the Cantonal Revolution in 1873. Many public and private buildings were constructed and these reflected the eclectic Modernista trends that were dominating Spain at the time. The city's Ensanche, or enlargement, project was published on 4 January 1897 and was an important milestone marking the growth of the city, which had hitherto been confined to the narrow limits defined by its city walls. Cartagena experienced its golden age during this time as a result of an increase in mining and trade. The new architecture of the city encompassed all sectors of activity in Cartagena, such as theatres, shops, factories, warehouses, military installations and residential blocks. All these reflected the new economic bonanza the city was enjoying. Building façades therefore became a manner of displaying the power of their inhabitants, architectural elements profusely covered with decoration that at times had great symbolic meaning. They provided movement to the solid textures of the sides of buildings through the use of plasterwork, glazed tiles, wrought iron and glasswork. The train station, with its decorative Modernista highlights, such as the iron details on its doors and columns, glass canopy and thermal façade window. 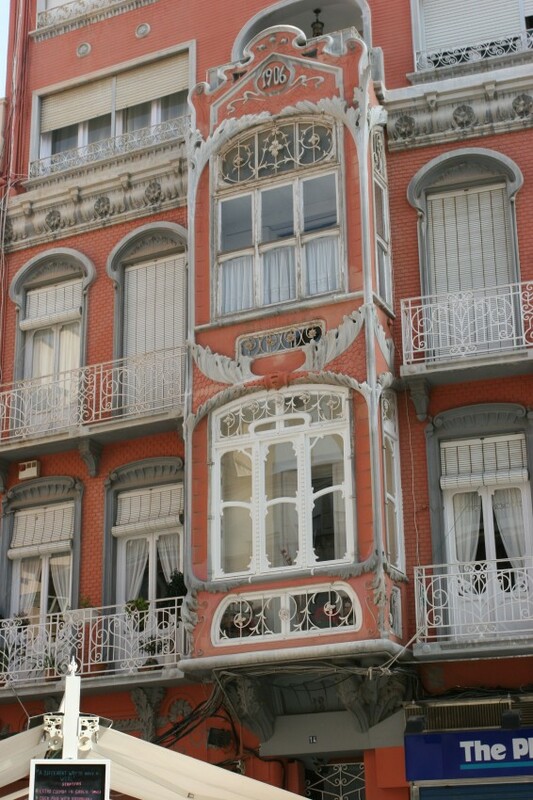 Only some details of its original Modernista decoration have been preserved inside. The Palacio de Aguirre, which is dominated by a tower section capped by a brilliant cupola. On either side are two profusely decorated façades with rococo style tiles and bee motifs on the tower symbolising industry. With its Baroque airs, the façade of the Casa Maestre was inspired by that of Gaudí's Casa Calvet and is the only original part of the building that has been preserved. The Casa Clares, which was designed by the local architect Mario Spottorno (1907). 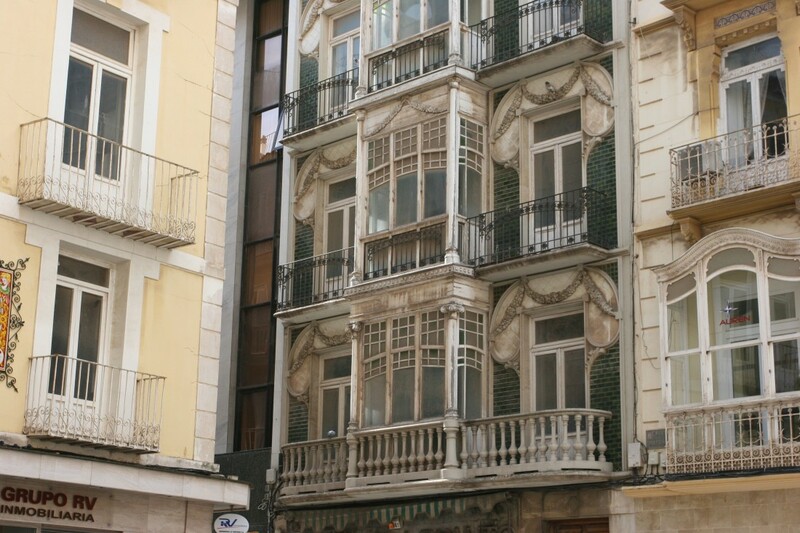 The façade on Calle del Aire is highlighted by the evidence of a Modernista style in its cornice, stained glass windows, floral details and capitals on the ground floor. The various façades of the Palacio Consistorial are eclectic in style and construction and all differ from each other. The influence of Modernisme can be seen in the decorative paintings and details of the noble areas of the foyer and first floor. The Casa Cervantes was Víctor Beltrí's first work and is highlighted by its size in comparison with all the other Modernista buildings in the same street. The Casino, with its 18th-century façade, recalls the building's origins as the former home of the Marquis de Casatilly. 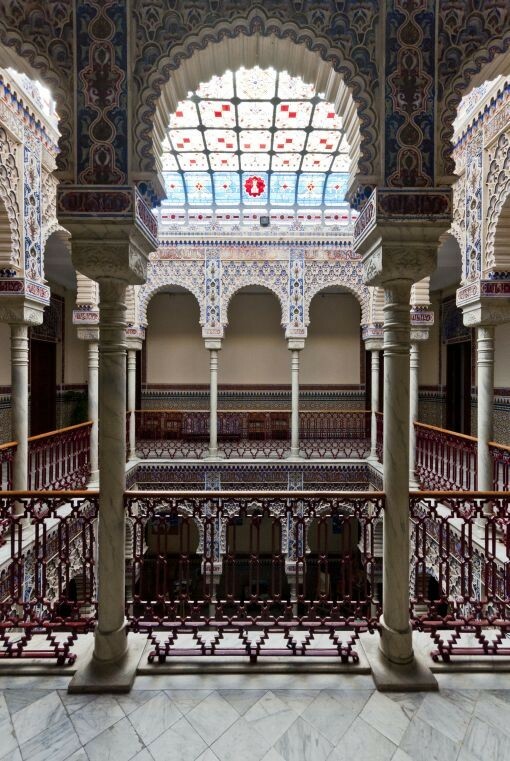 It was definitively remodelled by Víctor Beltrí in 1897 and has an outstanding interior courtyard. Its decorations and furniture are Modernista in style. 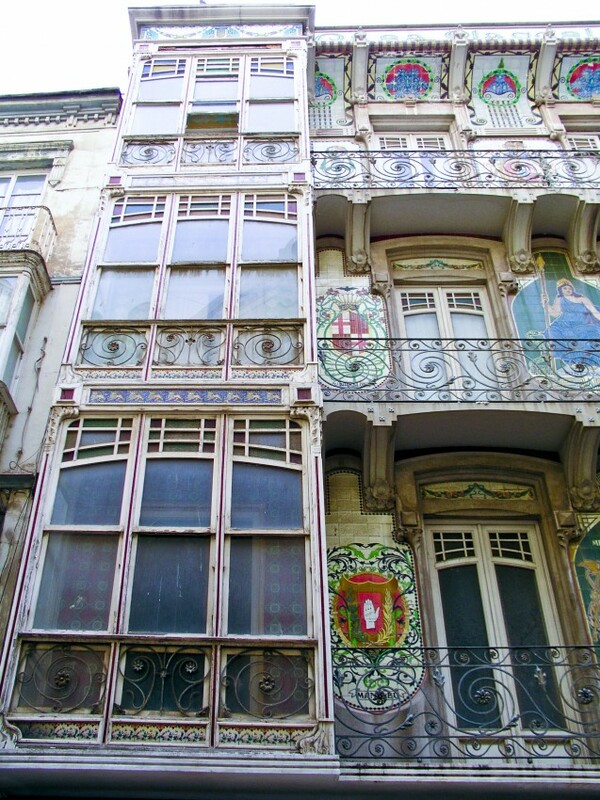 The façade of the Casa Llagostera (1916) was designed as a support for its ceramic decoration. The ceramic work by Gaspar Polo represents the allegorical figures of Minerva and Mercury and the coat of arms of Barcelona, Cartagena and Manlleu. The Gran Hotel (1912) was designed by the architect Víctor Beltrí and was influenced by Viennese Secession and French Art Nouveau. One of its distinguishing features is the use of colour to avoid monotony on its six floors and the decorative iron details on its doors and canopies. The Casa Dorda, also designed by Víctor Beltrí, combines a popular bay window structure with a considerable row of balconies. The façade's inspiration is Baroque and it has a curved roof with moulding and floral adornments. The Casa Zapata, by Víctor Beltrí, is Modernista in style but Gothic in its inspiration. Highlights of its exterior are the columnated portico and crenellated tower and the touches of Viennese influence on its walls. The interior courtyard has an Arabic style stained glass covering.